I was pleased that my recent post on Cedric Foskett Gordon attracted a lot of interest and was delighted to receive an email from another of Cedric’s nephews, Keith, the son of his eldest brother, Thomas. Keith wrote that he has in his possession many of the letters that Cedric wrote home to his mother, brothers and other family during the war and afterward during his service in Russia and China. Keith very kindly sent me the first batch of letters that he has transcribed, covering the period from August 1914 until March 1915 when Cedric was wounded. These letters alone run to 24 pages, a total of 24,000 words and each one repays reading. What emerges from these letters is a strong sense of a close, spirited family, each with at least one nickname (Cedric’s was ‘beast’ owing to his general strength), and a spirit of adventure embodied by Cedric himself. No doubt some of his insouciance is designed to reassure his worried mother, to whom all of these letters are addressed, but however insistent he is in his view that this will be a short conflict, he is no fool and has a sharp eye for detail, a regard for his fellow officers and the men under his command and a steady nerve for the task ahead. 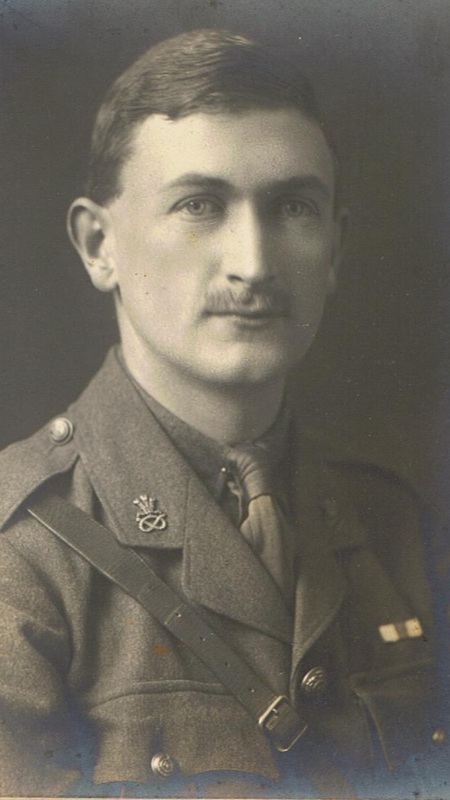 Cedric’s letters open when he is a Lieutenant stationed in Buttevant, Cork, with 1st Battalion, The Prince of Wales’s (North Staffordshire) Regiment, having joined the army in 1910. They cover the early days of the war, his view that ‘it will all be over by Christmas‘ and detail his journey to the Front. With Keith Gordon’s kind permission I reproduce below a selection of the letters from the first two months of the war, which culminate in a long letter to his mother that was subsequently printed anonymously in The Times. This blog post is much longer than any other I have written but I hope you will agree that Cedric’s letters give a fascinating insight into the man and the early days of the war and will be of interest to both local historians, those with an interest in the North Staffordshire Regiment and more general scholars of the war. My thanks to Keith Gordon for allowing me to publish these extracts (copyright remains with the family). Letter to darlingest Mother. I hope you are keeping well and not taking this scare to heart. It is quite all right. I don’t suppose we shall go abroad, although we may mobilize, I suppose. I think it is all rather interesting. Please don’t worry, dear old mater. I am quite well. Yesterday I went out to shoot duck, but with no success. I didn’t see one the whole afternoon. It rained a good bit, but today is finer. I really expect they will still manage to patch things up alright. Bill (a dog) is flourishing but getting rather portly, good living in camp. He is quite sorry to leave I think. We have been busy the last day or two getting things ready in case that we do have to move. It has been rather fun. I had a letter from the Cat (Cedric’s brother, Basil) this morning. I believe that I must have been accepted for this signalling course as I have had letters from various landladies in Aldershot. I suppose I shan’t go unless things quieten down a bit before then, so you mustn’t be surprised if yours truly doesn’t turn up! I hope to celebrate my 24th birthday (7 August) one day this week. I’m afraid I shan’t be at home for it. I think it would be a good plan to keep him ‘till I come home again. I hope you will keep well at Sevenoaks. Please don’t worry. No news at present. I’m very glad Bill (Cedric’s brother Bernard who was killed in a flying accident whilst with the RFC in December 1916) did so well in his exams. I hope he will get a move up all right. We are in the middle of mobilizing, & are pretty busy at present. We have heard nothing at present about where we are going. I have packed all my kit up & in time shall probably send it off to Linden Chase (the family home at Sevenoaks), also Bill. I will let you know when he is coming. Pr’aps you can board him out with Marchant or someone. I do hope you are not taking this too seriously. I am looking forward to it immensely, the only drawback is I’m so afraid you will worry. Please don’t. I do hope you are well dear old Mater, don’t be anxious on my account I shall be quite all right. Bill is well, but doesn’t enjoy mobilizing! I hardly like to send him off now as it might take him a day or two to get back as I suppose all the traffic is more or less disorganised. Well, nothing more just now. Very best love darlingest, & please don’t worry. We will knock the Germans into a cocked hat before they know where they are. It will serve them jolly well right for being asses. Thank you all very much for your kind birthday letters & good wishes. I am very happy & looking forward to going out awfully. With any luck we should be moving early next week, Sunday or Monday, but nothing whatsoever is known yet, either of the date or destination of our move. The Belgians seem to have been doing splendidly. We got 400 of our Reservists (men who have done yrs with the regulars & who have gone back to civilian life) to-day & expect 400 more to-morrow. We shall be then ready to move. I command a “Platoon” of 50 about. There is no signalling course in war now. I hope we shall arrive in time for the big battle, but I suppose you hope otherwise. Kitchener is splendid. We ought to give the Germans a bit of a knock between us. I wonder if old Cripp (Cedric’s brother Donald, who was killed at the Somme on 3 July 1916) & the Cat (Basil) will be taking commissions. Tell them to try to get into the 4th North Staffords, or the special Bn affiliated to us which they are forming. It’s been pretty strenuous work mobilizing. We are allowed to take 35lbs of kit with us in our “train”. I’m taking that Jaegar bag of EBMs (Cedric’s grandmother, Emma Bowles Milford), spare boots, shirts, socks, towels etc & a valise. I don’t think the war can last very long. I had a terribly near shave of going to one of these new Bns they are forming. They were taking the junior of each rank. I’m the junior Lt. The Adjutant got me off thank Heaven, a fellow from the 2nd Bn is going instead. They won’t get out as fast as soon as we shall. I have been very busy packing up. Everything is pretty well ready now thank goodness. I don’t know when it will be sent off. The Army & Navy Stores are arranging about it. I have labelled it Linden Chase, Sevenoaks. I expect there will be the deuce of a lot to pay at yr end. I will refund it, if you can pay on delivery. I daresay it won’t arrive for some time. I shall be very pleased if anyone will make any use they like of anything they may take a fancy to. I have asked the man who runs the Coffee Shop, a Mr Weight, to look after Bill until traffic is more or less normal & then to send him to Linden Chase. I wish he could come with me! I shall be back home at Christmas. You just see if I’m not! I’m glad the dogs are in good form. No time for more now darlingest. I will write again as soon as I can. God bless you. We haven’t moved yet & we don’t know yet when we shall, sometime during the early part of the week I expect. We are, I think, about to go. We are something over a 1000 strong. I command a Platoon, No 5, of about 50 men. A jolly fine lot. I’ve got 2 sgts and 3 corpls. Major Leman commands ‘B’ Coy. We have been very busy fitting up the men, boots are rather a difficulty. We are to carry 2 days rations on us, Bully Beef & Ration Biscuits. The Germans seem to be having rather a cheap time of it. I should think the whole show should be over in 3 months. I do hope you are not worrying about it, dear old Mater. I am quite well & shall be quite all right. I was very amused with the kids’ letters. They seem to have worked up a pretty healthy hatred of the Germans! I’m sorry for them, they are such assess. Still here (ie Buttevant) safe & sound, but I wish we could get off! I suppose you aren’t quite so keen. Dear old Mater please don’t worry about me. I’m so sorry for you & often think about you and hope that you don’t feel overanxious. Cheer up old bird, I shall come back all right. We’ve heard nothing about going yet, but everything is kept very secret. I was inoculated against enteric yesterday. Nearly the whole Regt was done. The effects are supposed to last 36 hrs. It only made me feel rather cheap and it gives you a jolly sore arm. I’m all right again now – it knocks some people completely out. They say all the French Army have been done. It’s rather a good thing I expect. I went to Church on Sunday Evening. We had an awfully nice service & address. The Reservists are a funny crowd. They do a good bit of grumbling, but I think it is in their nature to. Well, we started yesterday but didn’t manage to get very far! Our train left Buttevant at 3.30pm & we hadn’t the slightest idea where we were going to. On reaching Cork Station we were told to get off & were marched to a Picture Palace where we spent last night. I believe we were to have gone by boat somewhere, England is rumoured, yesterday. We shall probably go today. Perhaps we shall arrive at Dover or Folkestone! We had a great send off from Buttevant. The nationalist volunteers’ band played us down to the Station & all Buttevant turned out to see us. The band played ‘Auld Lang Sine’ They all cheered us as we went. I said to one old man that they were giving us a jolly good send off, he said ’Ye most honourably deserve it’! ½ the Bn spent the night in the Town Hall, but my half slept in the Picture Palace. They gave us a free show last night which pleased the men. People have had cigarettes & things given us by different people. It is strange what a difference the war has made. 3 weeks ago we were jolly nearly fighting the (Irish) Nationalists & here they are now cheering us & turning out their bands & things. I am sure the war is doing a lot of good. We had our valises last night & were quite comfortable. We have had our meals in the Club. I hope Bill has arrived safely. Please send me a line as soon as you can about him. Dear old Mater I do hope you are all right. I am. They are keeping things pretty dark at present. No time for more. We are just going out for a route march. Best love darlingest to you & all. Please don’t worry. I shall be quite all right. From 16 August until 7 September, Cedric was moved with the battalion to Cambridge – where he managed to dine at Kings and Magdalene and spend time with his brother, Basil, who was at Pembroke College as well as his mother and brother Donald – and then Newmarket before journeying to Southampton. Thank goodness we really are off at last. It’s absolutely topping. We started last night at about 9.30pm from Newmarket. I saw a good bit of Cripp (Donald) & Bill (Bernard) before leaving. My platoon was on the loading fatigue in getting all the wagons etc onto the train. Everything went well & we went off in grand style. We arrived here at about 4am this morning. We unloaded & got onto the boat, the ‘Lake Michigan’. Only ½ our Regt is on it, so altogether there are 3,000 odd of us. It’s pretty tightly packed. It is an emigrant boat I think. It’s been over 2 or 3 times before with troops. It’s pretty dirty but still it’s not for long. We are reported to be going to St Lazaire, about 80 miles SW of Paris I believe, & are supposed to be going to sail at about noon I think. They say it will take 32 hours or so. It looks fairly calm at present thank goodness! It will be some little time, a week at least before we can get to the front, & of course we may not go straight away. Please don’t worry about me I shall be quite safe & sound. It was very nice seeing you at Cambridge. I hope that the war will be over by Christmas & that I shall get home then. They say that there are some German prisoners in the docks here. Some of the people have seen them. We have just had a good breakfast here, ….& henceforth Bully Beef & Biscuits. I do hope you are all right dear old Bird. Please don’t worry. I am sharing a cabin with another fellow, Hobart, in my Coy. He is a very nice fellow. He got married lately at Bullevant & had just got his wife over to Newmarket when we got the order to go. Rotten bad luck. She was awfully cut up. Very best love to all. I will write again when I can. We sailed yesterday at about 2.30pm & are now on the sea. Thank goodness it has been fairly calm, & so far I haven’t been ill. It was lovely yesterday & as calm as a millpond but it’s raining a bit this afternoon & there are some unpleasantly large waves. However we hope to get in early tomorrow & so I hope to stick it. We have been quite comfortable on board. This is a Canadian Pacific boat, & it’s all 3rd class & strange. I am sharing a cabin with 2 other fellows. The men are pretty tightly packed down below, & the horses are down there too & so things are pretty thick down there. I have spent a good bit of this morning darning my socks. I’m quite a dab at it! I slept like a log last night. There’s not much to do on board as everyone is so tightly packed there is not much room to move about. I went out into the town yesterday morning before we started & did some shopping. Some of us went & had a bathe, the last of the season I expect. All our letters have to be censored now, so I shan’t be able to tell you where we are or much of what is happening. We are fed quite well here & haven’t started our ‘Bully’ yet. I hope D & Bill (Donald & Bernard) have got home all right. It was very nice having them. I wonder if D has joined yet. I hope he will get on all right. Please give my best love to everyone. No more news at present. I will write again as soon as I can. Letter to darlingest Mother, France We have arrived so far safely. …. We were packed like sardines, & everything was v. dirty. We were on board about 4 days all together, of which we spent several waiting about to get off. It was awfully nice getting on land again. We had a great time buying bread, cigarettes etc, my foreign languages being a bit rusty we had great difficulty in making the inhabitants understand our wants. We landed yesterday about 10am & started off by train about 9.30pm. The men are packed pretty tight, 40 to a sort of cattle truck affair. We are more fortunate, 5 to a jolly nice 1st Class compartment. The country is awfully pretty about here, & there is a great abundance of fruit, vines, pears, nectarines etc. We have just purchased a large melon for 3d. We are getting government rations now & buying butter etc. I don’t know where we are off to. I only hope we shall get at these Germans soon. They seem to be on the trot now. I’m afraid I can’t give you much news as one can’t give any names or anything else. We passed 2 lots of German prisoners. I believe they were jolly glad to get caught & be out of it. They don’t much care for being caught by the French, they prefer the English. These are nice trains, one can walk up & down on the footboards outside; but they don’t go very fast. Today doesn’t seem much like a Sunday! It was only last Sunday I spent at Newmarket with D & Bill. Has D joined Kitchener’s army yet? I shall be very interested to hear how he likes it. The inhabitants of this place are very friendly. They tie up packets of fruit & put them on poles & hold them out for the men as the train goes past. At one station we stopped & the inhabitants sang ‘God Save the King’! At another there was a Regt of soldiers going off. There was great cheering, there are lots of pictures of Kaiser Bill with weird remarks attached. I hope you are all & Bill are flourishing. I’m quite all right. We got a bit wet yesterday entraining, but soon got dry again. It is rather showery here at present. We have at last arrived at our destination. It’s jolly fine here & we are having a topping time. There are reported to be some spare Germans knocking about here, giving themselves up whenever possible. We are going on at 12.30, marching about 9 miles. I must end up now as I want this to catch the post. Very best love to all. I am quite well & enjoying my holiday on the Continent. Sorry, this hasn’t gone yet. We marched yesterday about 9 miles & stopped in a small village. We were billeted, 3 of us slept in a small attic. The Germans are reported to have been there 4 days ago & we found some relics. Yesterday we passed a grave or two by the roadside & some shells etc, also trenches. There are some odd fellows knocking about here, but we haven’t seen any yet. I don’t think they have been misbehaving here. They have looted a bit of course & burnt an odd house or so. Today we are doing about 15 miles & billeted again, so far as I know. I expect we shall be home by Christmas. We are being fed quite well, & I have got everything I want. I wonder if you could send me a small electric torch & a spare battery for it, I think I may get it, but I suppose it’s rather doubtful. We haven’t had any proper war news for days, & I haven’t seen a paper for some time. I have started growing a beard & shall look a regular hooligan by the time I get back! I saw some wounded & captured Germans yesterday & wished them ‘Guten Morgen’. I have forgotten all the little German I ever knew. The villages & country round here are quite pretty. I haven’t had any letters yet, but no-one has. I suppose we shall one day. No more at present. I will add some if this isn’t sent. Best love. We have started fighting. The Battle we are in has been going on for days, I think 8 or 9. I believe the main body of the enemy are now on the retreat, and I expect we shall soon be on the track following them up. I hope we shall get a decisive victory soon. Two days ago we arrived here, a town under shell fire, and I was at once sent on (it was about 11pm and very dark) to go to the enemy’s trenches with three scouts to see if they were still there. It was a decidedly dangerous job. The General sent me out. I went about 300 yards in front of my scouts. It was a pretty jumpy job. The enemy’s trenches were about 950 yds from ours. I paced about 850 yds and then got down on my hands and knees and crept on for some way expecting every moment to run into a German trench. It was pretty black and I could only see a few yards in front of me. I crawled along for some way but didn’t come across anything. I had a loaded revolver and a map with me. Every now and then I came across a dead German, rather creepy. Well I couldn’t think why I had not struck the trenches so I went off to my left a bit as I thought I might have got too far off to my right. After I had wandered about for some time I got quite flummoxed and didn’t know where I was. The stars had gone in and I was pretty well lost in the middle of this big open plateau, expecting every moment to run into a German trench. After a bit I heard some people talking. I approached cautiously and heard that they were talking German so I sheered off again. After wandering about for a considerable time I heard some carts driving up the road. I approached with caution. There were four of them; I let the three leading ones go by and stepped out to the fourth, and put my revolver to the driver’s head and told him to halt. By Jove, the poor fellow was terrified. He put his arm in front of his face and squealed. I hadn’t the heart to shoot him, it would have been too much like murder. I let him go past and had a couple of rounds at his cart when he was past. He fairly let his horses have it, and went off at a gallop. The last I saw of him he was driving like a madman across country, I don’t know what became of him. Well I thought it was about time to be moving as I didn’t wish anyone to come along and find me so I went off in the opposite direction, I was completely lost and it was pretty dark. I wandered about and tried to find my track but I could not manage it. Suddenly I saw about a foot in front of me a trench full of men sitting down with their backs towards me. I was a bit surprised and was not sure whether they were our fellows or not. I said “Hello”, the man, I think it was an officer, who was nearest me turned round and said “Es ist ein Englander” or words to that effect. I didn’t wait to say good morning but shifted for all I was worth. I was followed by a regular tornado of bullets, I ran about 250 yds and then I came across a small trench into which I hopped. After I had been there about a minute I thought it was about time to be off so I got up and began to run again. I hadn’t been above ten yards when people began to shoot at me from all sides. I thought things were getting past a joke so, seeing a hole just to my right, I fell headlong into it, being in a bit of a hurry. It was now getting light and I could see it was hopeless trying to get on again, so I reconciled myself to the prospect of staying the day there, and trying to get on under cover of darkness next night. I discovered that the hole I was in was made by one of the enemy’s big shells striking the ground. The men refer to this gun of the German’s as ”Little Willy”. I was jolly thankful to “Little Willy” for making such a nice big hole. It was about 10 ft across and 2’6” or 3’ deep at the bottom and sort of V shaped. After having cogitated for a short while I came to the conclusion that I was behind the enemy’s line and must have crept through between two trenches in the dark; as I had met their transport on the road, that is what I must have done. I thought that if I just lay there I should be taken prisoner for a ship so I decided to bury myself. I set about it, my only implement being a jack-knife. In time I accomplished it. The ground was stiff clay and awfully cold and awfully heavy. I stuck it for some time and got cramp in both my legs and finally I could not stick it any longer, so I unburied myself and decided that if any Germans did come along I would lie as if I were dead, and take my luck. I was in that hole from 4 am till about 8pm at night and it was quite the worst day I have ever spent. I had nothing to do and could not even sit up. I hadn’t anything to eat or drink and I thought a very doubtful chance of ever getting away – I got quite homesick! It was dreadfully lonely and being hungry did not improve things. However I kept fairly cheerful on the whole. I tried doing everything I could think of, even cutting my hair with a very blunt pair of scissors. I didn’t get very far with that job! I also worked a fancy needlework for you, which I will give you when I return. I lay on my back most of the day and listened to the shells whistling past, and watched aeroplanes. There were a good many about altogether. I peeped cautiously out of my hole. Occasionally I could see the Germans about 200 yards from where I was in their trenches. I was now in front of them, they must have been sideways on to the one I ran into. There was a poor beggar dead (a German) not very far from me. There was a hedge about 200 yards from me on the opposite side from the Germans and I decided to creep for it at dark and to try and work my way round to the village where I left the Regiment. There was a good bit of rifle fire just over me, and I could hear shooting from the direction of the hedge, but I couldn’t see the bottom of it. It then struck me that our troops might be holding it. Well at dusk I shouted lustily towards the hedge that I was coming and told them not to shoot and crept forth. When I had gone some way I was advancing with my hands up and I should say that I was about 100yds from the hedge, a couple of rounds came whizzing past me. I fell down flat and crawled a bit nearer and shouted again. This time they heard me and after some parleying let me come in. I found that it was one of the Regiments in our Brigade and that our Regiment was in position on their left. By Jove I was thankful to find I was safely back. The loneliness was one of the worst parts of it. I wished I had old Bill with me in my hole. Well I got back to our Regiment and was greeted as one returned from the dead! Pope (Lt VV Pope, Lancing 1906-1910) had already written to you telling you that I was missing, but he got the letter back before it went. It was a rather trying experience, but I am none the worse for it. We are now in the trenches. Our Regiment is occupying the front of a wood and only half of it is there at a time, the other half returning to the little village in the valley below. I was in the village last night and slept in a real bed. The first time for 6 weeks. I slept from 12.30 in the morning to 5am next day with about 3½ hrs break in the middle. I had been up for two nights with only about ½ hr sleep altogether. It was topping. We came up into the trenches again this morning. There is nothing much doing. We get shelled occasionally and there are a few snipers about, but we have hardly had a man hit. Most shrapnel wounds are not too bad. I’ve got a jolly little trench and cave affair to get into when they start shelling and am as safe as a house. I got up a tree this morning with a sergeant and we did a bit of sniping. I think we hit a couple but it’s very hard to say. I had no luck! I expect you are glad! They found us out in the end and started potting at us. We descended mighty quickly. I am quite well and having a good time but still I shall be glad to get back again. I haven’t had a letter since we left England but I think only letters posted on the 11th have reached us so far. We are really quite safe, don’t be anxious dear old Mater. I thought about you and them all a good bit the other day when I was in Little Willy’s hole. I do hope you are all well. Following my appeal for information relating to any of the Sevenoaks Anzacs, I was pleased to hear from Keith Davey, a great nephew of Kenrid Davey, who was one of six men I had listed from the Sevenoaks area who had emigrated to New Zealand before the outbreak of war. 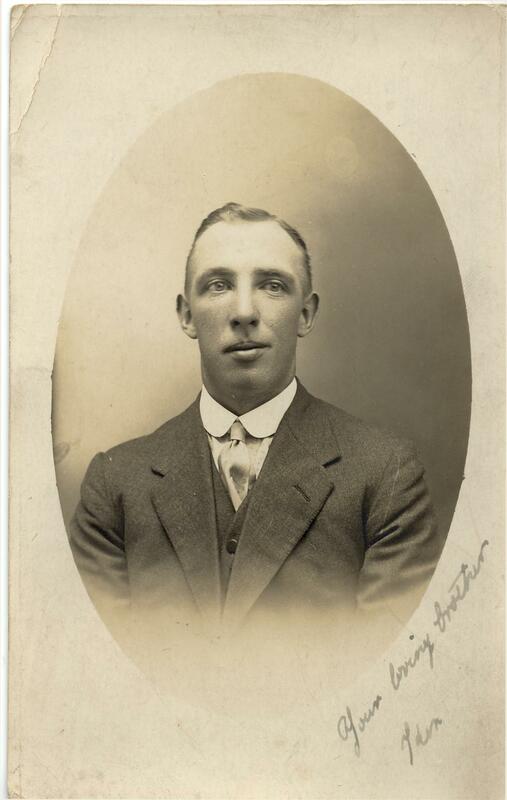 Kenrid Horace Davey was born in Riverhead in late 1888, the son of David Davey and his wife, Elizabeth, known as Lizzie. The 1891 census shows the family living on Chipstead Lane with David working as a plumber and painter; Kenrid was one of six children then living at home. By 1901, the family were living at The Old School House in Chipstead. There is a Horace Davey, aged 24 listed on the passenger list for the Ionie, which departed on 23 May 1912 for New Zealand. It’s possible that this is Kenrid and interesting to note that both George Marshall and Arnold Jarvis were also on board. Like Kenrid, both George and Arnold emigrated and later fought, serving with the AIF, but unlike Kenrid who survived, they are remembered on the Sevenoaks war memorial. It is interesting to speculate that they knew each other and were making the trip together. Kenrid’s service records show that was working as a butcher when he enlisted and was 5’4″ tall, weighing 155 pounds. He gave his next of kin as his father who by then was living at Saint William’s Villa, Dunton Green, while his nearest relative in New Zealand was his older sister, Phyllis. 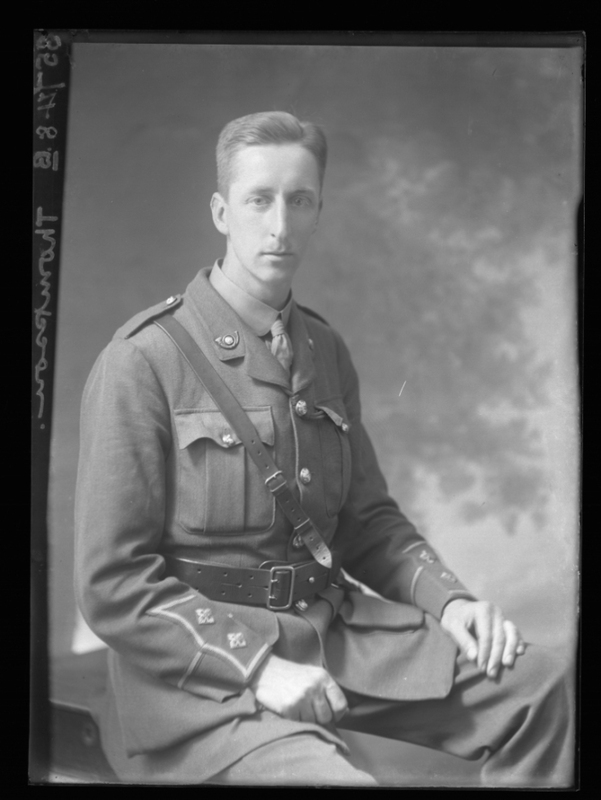 He embarked from Wellington on 9 October 1915 as a Rifleman in 1st Battalion, New Zealand Rifle Brigade bound for Suez and served in Egypt for the remainder of 1915 before leaving for the Western Front the following year. He was wounded in his left arm by a shell on 10 September 1917 at Ypres and was invalided to England two weeks later. His papers show a largely exemplary service record with just three disciplinary incidents: being AWOL for 2 hours in November 1916 (lost 14 days pay), trotting a horse on a cobbled road in January 1917 (lost 7 days pay) and for being without his helmet in March 1917 (lost 8 days pay). Kenrid returned to New Zealand and died in 1968. His brother, Keith Davey’s grandfather, Sidney Charles Davey, also served having enlisted on 29 August 1914 and joined the Royal Engineers, eventually being promoted to Lieutenant. 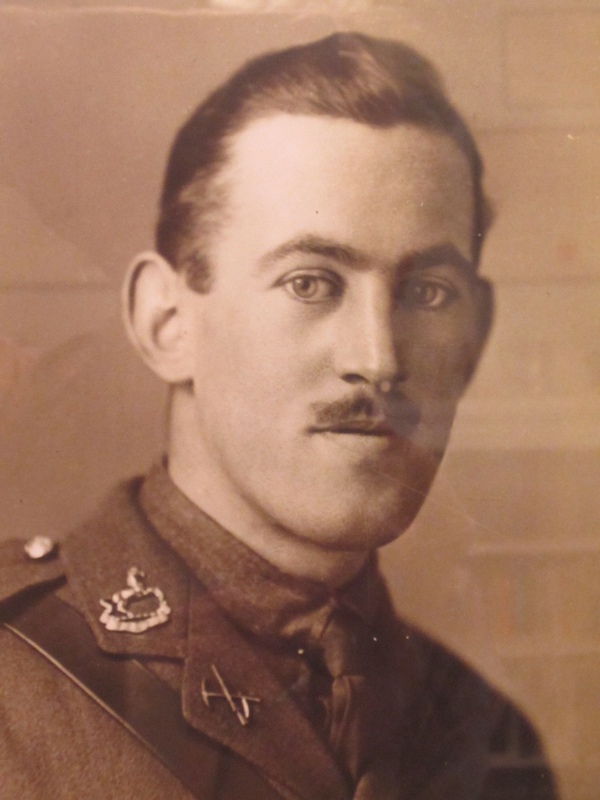 Keith also mentioned that several cousins of Kenrid and Sidney had also lived in the Sevenoaks area and fought during the war, including Horace James Taylor, a cousin through their mother Lizzie’s sister, Emma, who had married Alfred Taylor. Horace Taylor was born in Sevenoaks on the 26 December 1895 and his father, Alfred, would have been well known in the town as a harness and saddle maker. The 1911 census shows the family living at 50-52 London Road (which was also known as Belgrave House) with Horace and his younger brother Alfred listed as being at school and their older sister, Millicent, recorded as an assistant school teacher. Both boys attended Sevenoaks School as day boys; Horace could have attended any time between 1904 – 1912 and according to the Sennockian (1922) he left the school in 1912 and became a bank clerk. Horace enlisted in late August 1914 when he was nineteen, joining the West Kent Yeomanry and saw service with them at Gallipoli and in Egypt before going on to serve in Palestine and France. He served as a Private, albeit holding the rank of corporal for two brief periods. By June 1918 Horace had returned to England to attend a cadet course, and he spent the remainder of the war working at the Larkhill Reception Camp in Wiltshire. He is named on the Sevenoaks School’s Honour Board, in the 1914 Roll of Honour and on the roll of local serving men in St Nicholas’ Parish Church. His brother, Alfred, also saw service having joined the London Regiment (2nd Battalion) on the outbreak of war, but in 1916 was transferred to the West Riding Regiment (13th Battalion). Both brothers survived the war. Horace was known for his interest in and talent for cricket, first displayed at School when he played in the First XI 1910 – 1912. He was later a member of the Kent County side between 1922 – 1928. Horace married Doris Austin in Tonbridge in 1935 and lived on until 1961. Research has shown a further link with one of the men named on the Sevenoaks war memorial. In January 1916 Horace and Alfred’s sister, Millicent, married their former fellow pupil, Arthur Thompson, son of the Sevenoaks Post Office Superintendent. Arthur was killed later that year in the September during the Battle of the Somme. The Sevenoaks School Quarterly obituary speaks of “his young wife, whose courage under her cruel loss has taught us all a lesson of endurance and faith”. Arthur’s brother, Sidney Ernest Thompson, had died on 25 September 1915 and is buried at Greatness cemetery, Sevenoaks. My thanks to Keith Davey and Sally Robbins, Archivist at Sevenoaks School, for their invaluable help with this post. Please do get in touch if you have a link to any of the other Sevenoaks Anzacs or men named on the war memorial.